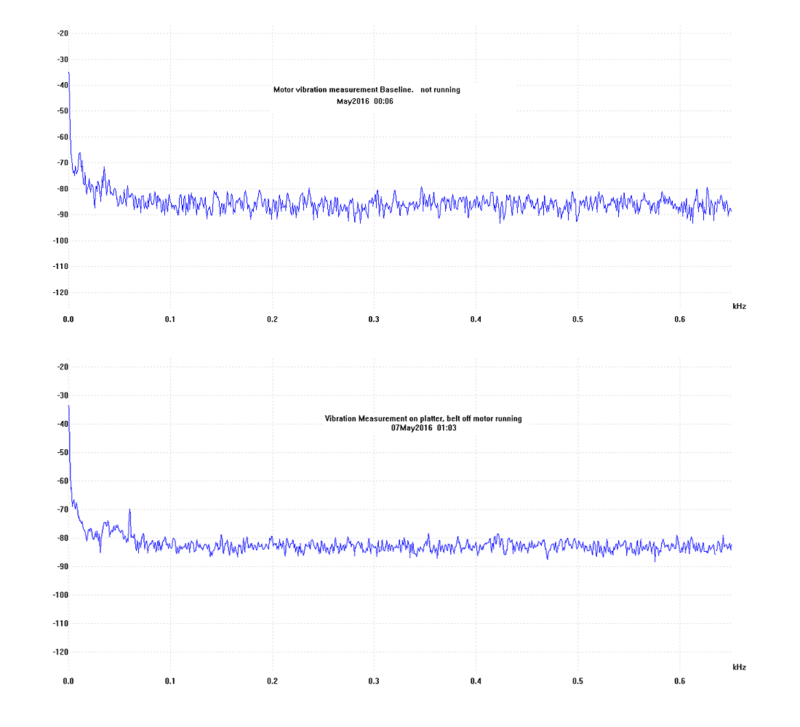 These views are the graph results of accelerometer testing of the Classic turntable with motor off (showing background noise) and motor on belt off showing noise spectrum with motor running. As you see we average almost 70 db down with a large percentage being 80 db down and always a minimum of at least 60 db down. My thanks to our new head of electrical engineering Mike Bettinger for these results. The test results show the inherent low noise of the Classic system, not as low as the HR-X/Aries/Prime with the separate motor, but way below anything on a record and most phono sections. Introducing the belt into the equation changes everything as things move (due to the belt not being 100% perfect) that disturb the accelerometer so the readings are not as clear but we will be doing that and we will be showing accelerometer tests on tonearms. I can tell you from the initial tests the 3D printed arm is significantly lower, in a measurable way, then any metal arm made. With the introduction of chief engineer Mike Bettinger to the VPI team there will be a lot more to come. We will try to measure what we hear and see if we can find a correlation. Best of all we will publish the incredibly low numbers of the Direct Drive and explain why it is the best table in the world. Can you superimpose both graphs in different colors on the same chart to facilitate comparison? I will have that done in the near future. rif wrote: Can you superimpose both graphs in different colors on the same chart to facilitate comparison? I'm sorry, I shouldn't have spoken for Mike but he is setting up all the test instruments finally (he has three projects he is working on including a month on the Levinson table drive system) and last time I looked in he was measuring a .03% wow and flutter on a Classic. Yes, all the testing is coming this month. Harry , you mentioned the Levinson turntable drive system Mat is working on. Is that the new drive system for VPI tables ? I remember Mat talking about a joint venture drive system for VPI tables. If this is it, do you or Mat have any idea when it would be available for us? Also, it would be great if you gave the option of a black or silver face plate. The Mark Levinson drive system is a joint venture putting the ADS drive into the motor assembly using advanced miniaturization. It is so good the table has won awards all over the world. That will eventually find its way into other products.